Okay. I'll admit it. I am totally smitten with owls. I love everything about them: their piercing yellow eyes; those tenacious talons that can take down large prey, snapping bones like twigs; their soft, bark-colored feathers that camouflage them perfectly, insulate them against the cold and help them fly very quietly in pursuit of prey. Great Horned Owl taking flight. Owls are elusive creatures, things of storybooks, legends and superstition. Most people only hear an owl’s deep hooting at night and might, if they are lucky, catch a fleeting glimpse as it ghosts overhead. Known as silent predators of the night, owls are capable of flying just inches from their prey without being detected - until it’s too late. The unique structure of their wings is designed to reduce noise caused by turbulence, allowing them to fly and hunt in near silence. So Many Owls, So Little Time. There are 200 species of owls and I have had the good fortune to see up close and personal ten species in my home state of Arizona. Here are some fun facts about owls along with the owls that I have met. Nocturnal Hunters. Although other carnivorous birds, such as hawks and eagles, hunt during the day, most owls hunt at night. Their dark colors make them nearly invisible to their prey—insects, small mammals and other birds—and their wings beat almost silently. These adaptations, combined with their enormous eyes, put owls among the most efficient night hunters on the planet. Looks like this Great Horned Owl put his pants on backwards! Astonishingly flexible necks let them turn their heads three-quarters of a circle, or 270 degrees, compared to 90 degrees for the average human being. Are They Really That Wise? In popular culture, owls are often depicted as extremely intelligent. 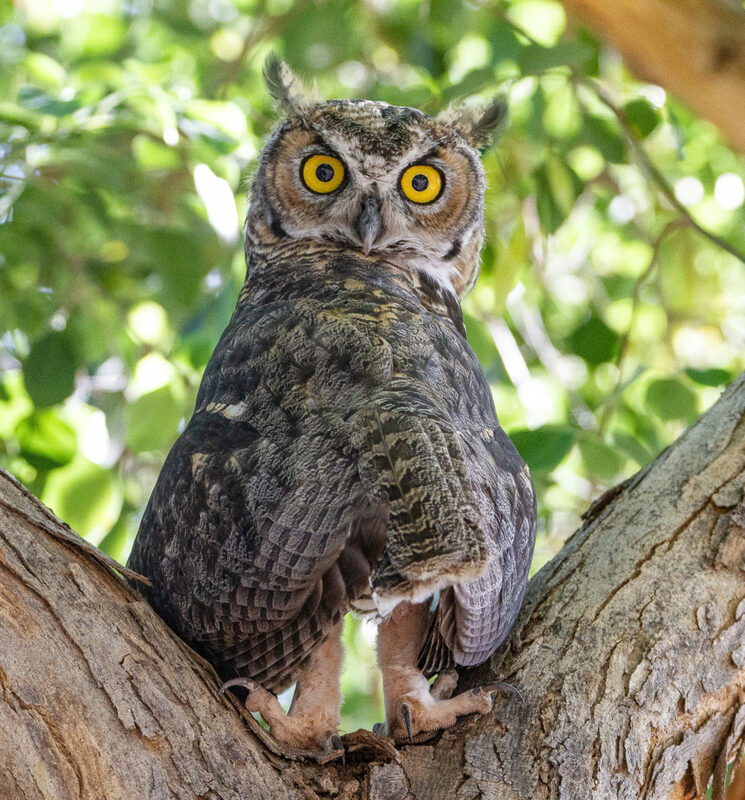 I've read that it's virtually impossible to train an owl (although a Great Horned Owl at the Arizona-Sonora Desert Museum in Tucson seems pretty well trained! ), while parrots, hawks ​and pigeons can be taught to retrieve objects and memorize simple tasks. But owls need lots of brain power to hunt at night and those saucer-big eyes convey the impression of high intelligence. Turning Heads. One of the most remarkable things about owls is that they move their entire heads when looking at something rather than moving their eyes, like most other vertebrates. Owls have large, forward-facing fixed eyes to gather scarce light during their nocturnal hunts and have astonishingly flexible necks that let them turn their heads 270 degrees, compared to 90 degrees for the average human being. Powerful Talons. As befitting birds that hunt and kill small prey, owls have some of the strongest talons in the avian world, capable of seizing and grasping squirrels, rabbits and other wiggly mammals. 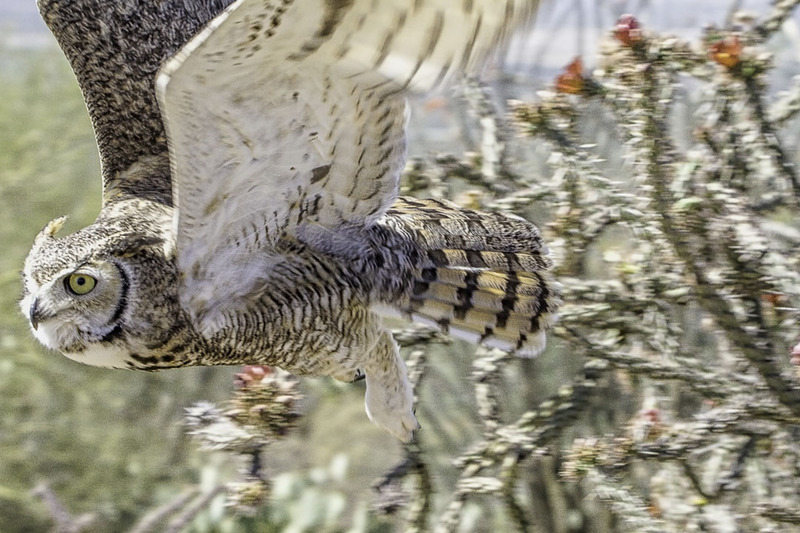 One of the largest owl species, the Great Horned, can curl its talons with a force of 300 pounds per square inch. Some unusually large owls have talons comparable in size to those of much bigger eagles, which may explain why even desperately hungry eagles usually won't attack their smaller cousins. Myths and Legends. Ancient civilizations had widely divergent opinions about owls. The Greeks chose owls to represent Athena, the goddess of wisdom, but Romans were terrified of them, considering them bearers of ill omens. The Aztecs and Mayans hated and feared owls as symbols of death and destruction, while many Native American tribes scared their children with stories of owls waiting in the dark to carry them away. The ancient Egyptians had a kinder view of owls, believing that they protected the spirits of the dead as they traveled to the underworld. Meet The Owls. I am lucky to have been able to find, observe and photograph two of the ten species in my own neighborhood, but others I've had to search out across the state and others have just found me. Great Horned Owl. 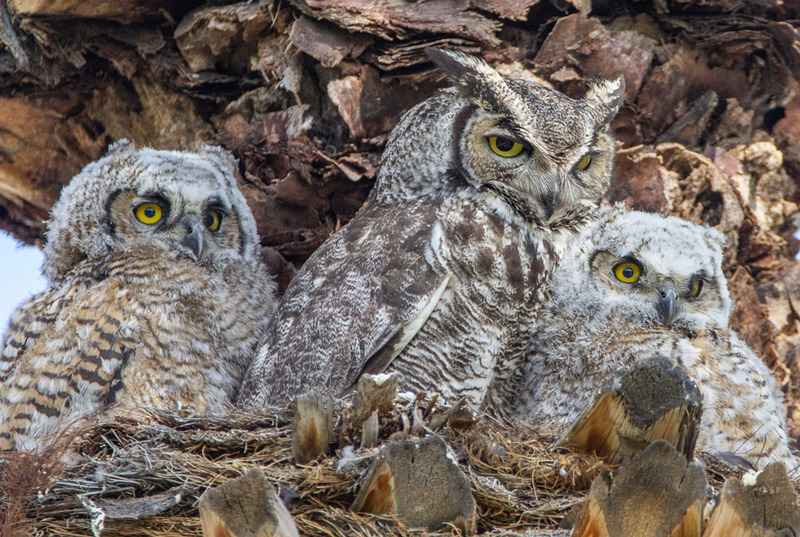 If you've been following my posts, you will have read about the mated pair of Great Horned Owls that raised two young ones in a park near my home this year. There were originally three owlets, the third and smallest was taken by a Red-tailed Hawk. The other two fledged successfully, although perhaps a little too early when the larger of the two dropped the family's lunch (a small rabbit) from their nest. While I still occasionally see the the family around my neighborhood as Mom and Dad teach Junior how to fend for himself, I haven't seen the second owlet in quite some time. I dread to think what may have happened to him. 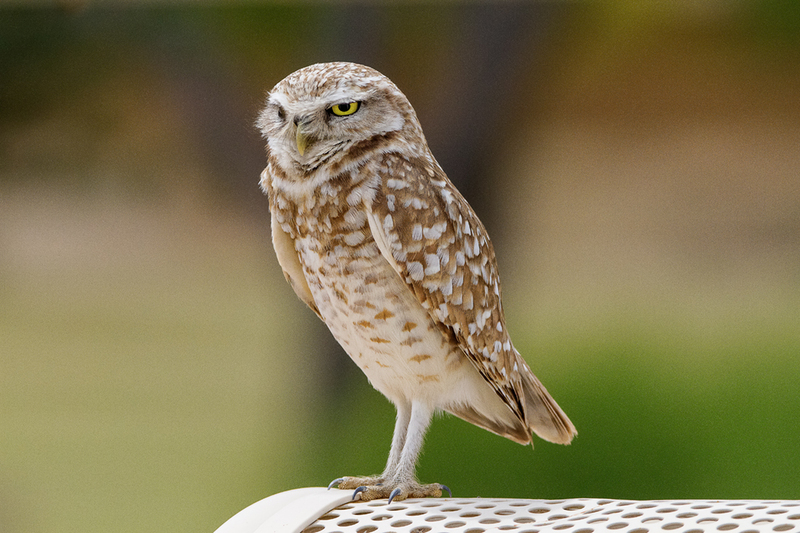 Burrowing Owl. On average, these owls stand about 10 inches tall and are sand colored with bright yellow eyes. They live underground in burrows they’ve dug themselves or taken over from a prairie dog or ground squirrel. A male and female built a nest in a cavity under the sidewalk of a busy intersection near my home years ago and they (or another pair) have occupied that space for at least five years and raised plenty of young ones. They don't seem bothered by their proximity to humans and their pollution. In fact, Burrowing Owls have a higher tolerance for carbon dioxide than other birds—an adaptation found in other burrowing animals, which spend long periods underground where the gas can accumulate to higher levels than found above ground. A sleepy Barn Owl tries to nap in his roost under a bridge. Barn Owl. 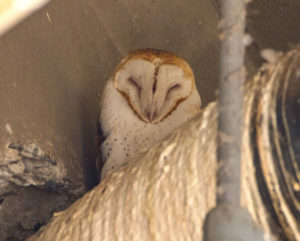 Many people’s first sighting of a Barn Owl is, as it's name would suggest, in a barn or other old, abandoned building. Or they may glimpse a flash of pale wings in the headlights while driving through open country at night. Lean and tall, this owl sports a ghostly white face, chest and belly with buff-colored upper parts. It roosts in hidden, quiet places during the day and by night, hunts on buoyant wings in open fields and meadows. This one (right) was trying to take a nap under a bridge in a wildlife area near my home. Despite a worldwide distribution, Barn Owls are declining in parts of their range due to habitat loss. Two Tiny Owls. 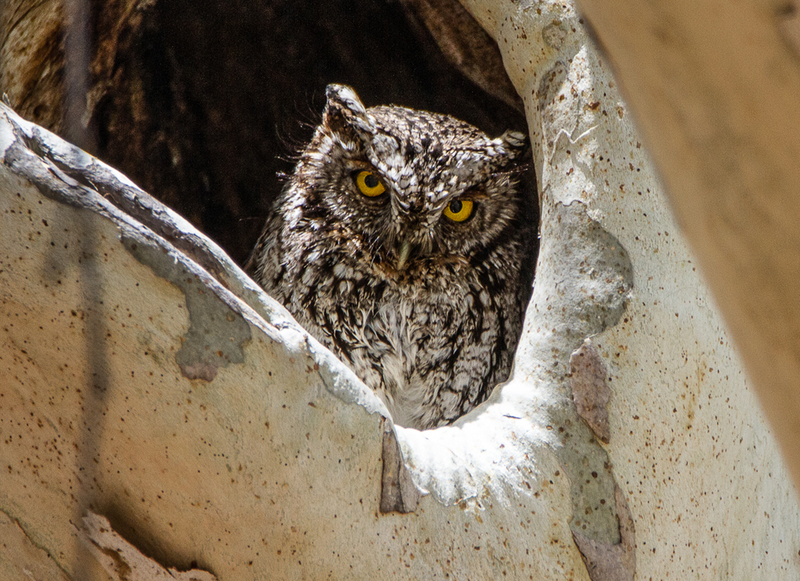 The Whiskered Screech Owl (above), is compact at about 7-10 inches–not much taller than a standard pair of binoculars—and hunts in the woods and deserts of western North America, where their wide-ranging diet includes everything from worms and crayfish to rats and bats. 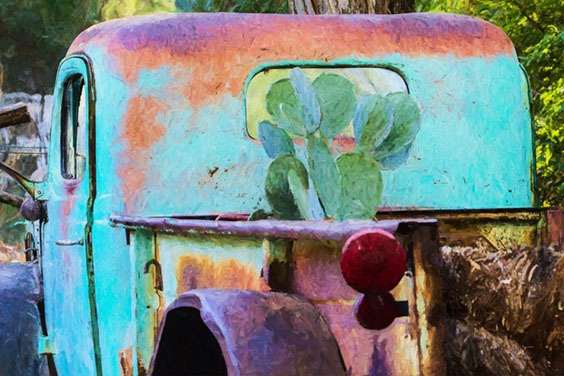 This one found a home in an Arizona Sycamore along a narrow road near the small town of Portal in Southeastern Arizona. The Northern Pygmy-Owl (left) is the smallest owl I've seen–only about 6-7 inches. Despite it's size, it is a ferocious hunter with a taste for songbirds. These owls are mostly dark brown and white, with long tails, smoothly rounded heads and, again, those yellow eyes. They hunt during the day by sitting quietly and surprising their prey. As a defensive measure, small birds often gather to mob sitting owls until they fly away. We located the nest in Madera Canyon last May and watched as the impatient little ones waited for their mother to return with food. Owls with Ears. Some owls appear as though they have ears like a cat, but in reality what you are seeing are tufts of feathers. 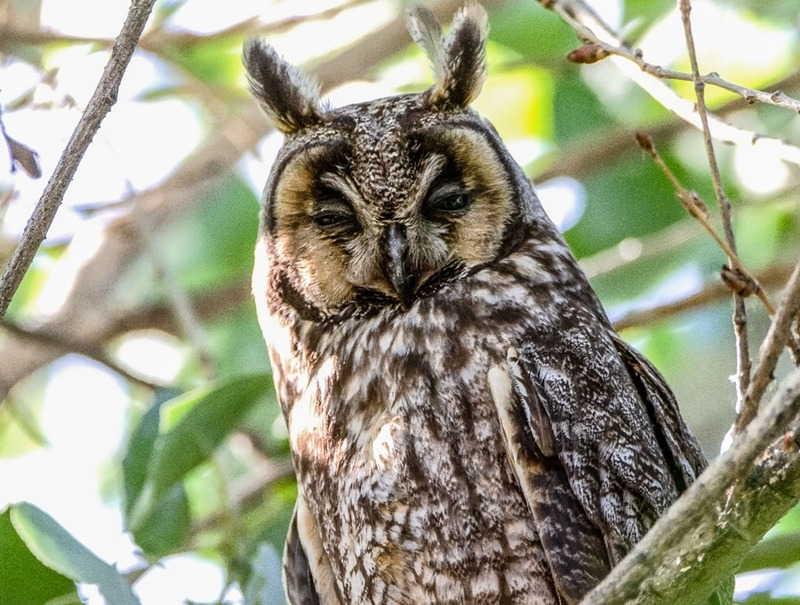 This lanky Long-eared Owl seems to wear a surprised expression thanks to long ear tufts that point straight up like exclamation points. These nocturnal hunters roost in dense foliage, where their camouflage makes them hard to find, and forage over grasslands for small mammals. This one wound up at Gilbert Water Ranch for a few days to my utter delight. 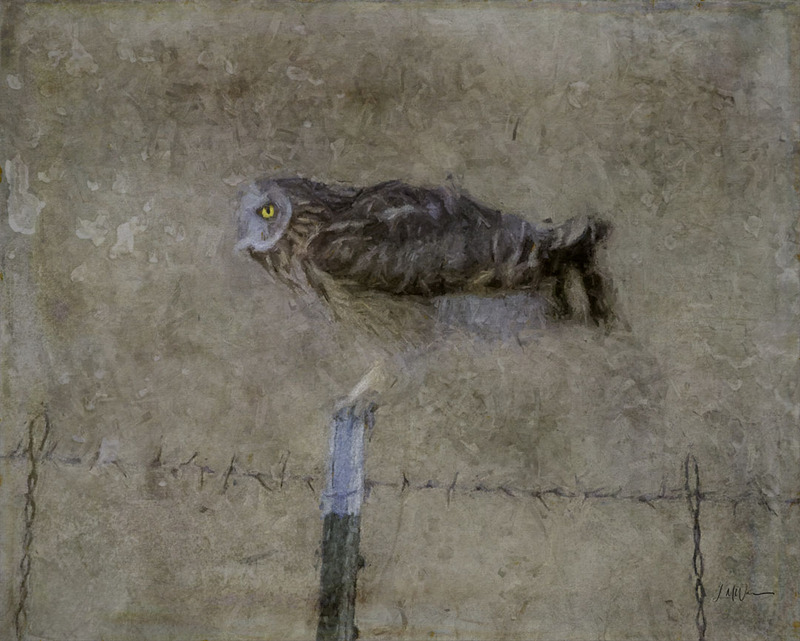 Last winter, I found myself driving with my friends, Brian and Susan, along an isolated dirt road in the San Rafael Grasslands in pursuit of Short-eared Owls. This is a unique area in Southeastern Arizona with rolling hills, native grasses and oak and cottonwood trees. As some of the last remaining short grass prairie habitat left in the American Southwest, this area is of vital importance for grassland birds. Just as the last lingering rays of the sun were leaving the sky and we were headed into town for the night, we were rewarded with views of not just one, but two Short-eared Owls. Below is a digital illustration based on a rather blurry photo that I took of one of the owls (which can be purchased in the Gift Shop, as well as other owl images). With its black-rimmed yellow eyes staring out from a pale facial disk, he (or she) was just about to launch itself off into the night. The Spotted Owl is a large, brown-eyed bird that lives in mature forests of the West, from the giant old growth of British Columbia and Washington, to California's oak woodlands and the steep canyons of the Southwest. At night it silently hunts small mammals. 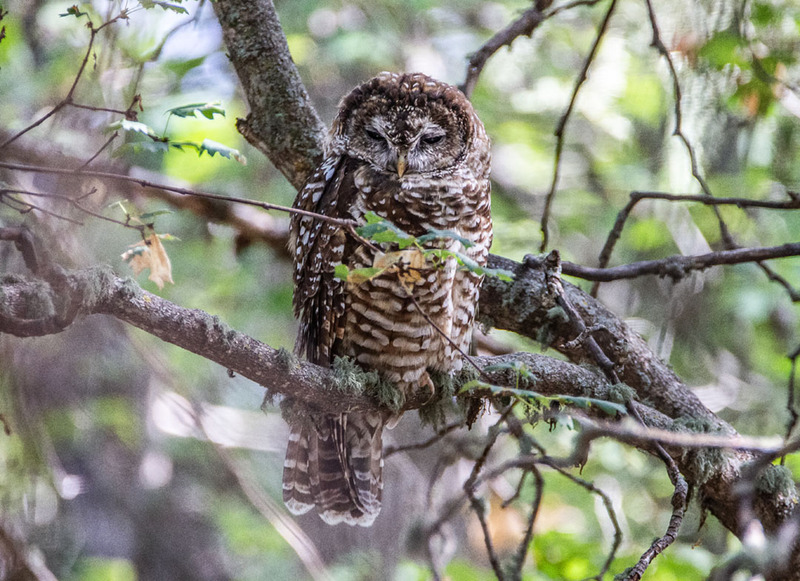 Despite federal protection beginning in 1990, the owl is still declining owing to habitat loss and competition with Barred Owls. Even though this owl doesn't have my favored yellow eyes, he more than makes up for it with his gloriously spotted feathers. 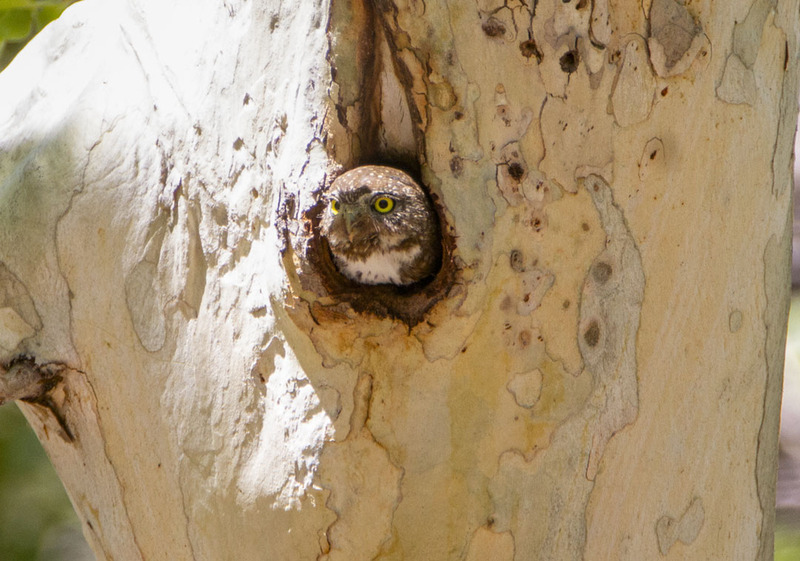 While out on a birding trip in the Pinal Mountains, we ran into some friends, Dara and Jeff, who spotted (pun intended) this owl and its mate and kind enough to show us where they were. Ten Down, 190 to Go! There were two other owls, the Elf Owl and the Western Screech-Owl, that I have only heard, so we'll save them for another post. I do feel very privileged to have seen these beautiful creatures of the night and will continue to search them out, photograph them (if they'll let me!) and discover new things about their fascinating lives as I travel around the state and the country. As my friend, Sharon, said, "Who knew there was so much to learn about owls?